A great resource for collageing, our Gompels Felt Off Cuts Bumper Bag has been packed with everything a creative school needs. Soft to the touch and easy to handle, each piece is suitable for use by younger children while also appealing to adults with it's easily moulded qualities. 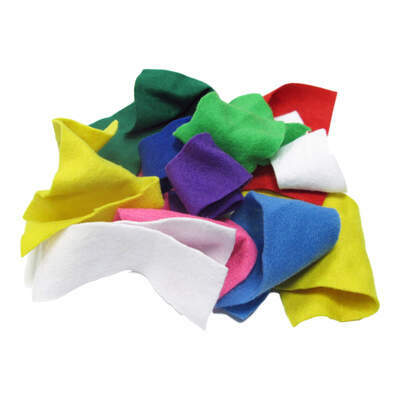 This large bag has been filled with an assortment of high quality felt in a range of vibrant colours that are sure to attract and keep the attentions of every single one of your pupils. Cut into different sizes for all different projects, these pliable felt off cuts bond well with all adhesives including normal PVA through to sticky tapes and comes pre-packed for compact storage. Here at Gompels, we have a range of own branded items to assist with your nursery or primary school needs. With everything from our Assorted Coloured Matchsticks through to our large pack of Wiggly Eyes and Assorted Colour Buttons, we've got everything you've been looking for right here.